With consolidated net sales of approx. 2.2 trillion yen and sales from overseas operations making up approx. 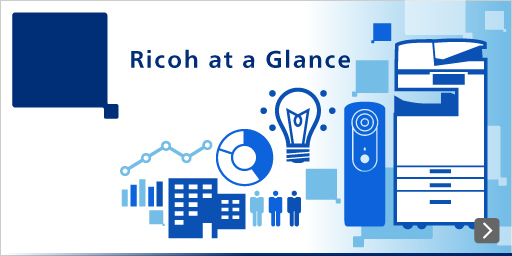 65% of our global revenue, Ricoh is truly a global leader in office equipment solutions, helping our customers around the world achieve greater productivity and workflow innovation. In addition to marketing MFPs, Ricoh has extended its business to solution services. In recent years, we have entered the production printing market and industrial products fields, additive manufacturing, and community building. Ricoh continues to grow its business. It is the Ricoh Group's policy to maintain stable dividend payments. A mid to long-term total return ratio target of approx. 30-50 % is aimed for, while maintaining sufficient retained earnings to build a stronger organization and develop new businesses.